Cedar Hill State Park is located on FM 1382 and the eastern shore of Joe Pool Lake in Cedar Hill, Texas (USA), ten miles southwest of Dallas. The park was acquired in 1982 and was opened in 1991. 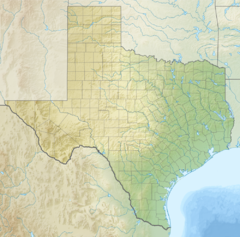 The Texas Parks and Wildlife Department operates the 1,826-acre (739 ha) park. Cedar Hill State Park has two available camping areas as well a boat ramp, a small picnic area, and a fishing jetty. The Penn Farm Agricultural History Center is located within the boundaries. The farm has reconstructed and historic buildings from the mid-19th century through the mid-20th century. Designed, built and maintained by DORBA (Dallas Off-Road Bike Association), this trail is 12 miles long and consists of three concentric paths—3 miles (Short), 8 miles (Middle) and 12 miles (Outer). This page was last edited on 5 July 2018, at 21:42 (UTC).